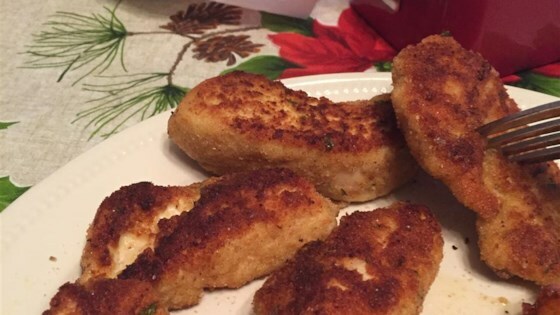 "Chicken tenders that are just the right size and flavor for kids and adults alike. These tenders are moist and flavorful with breading that never falls off." Combine crackers, garlic salt, and ranch dressing mix in a resealable plastic bag; squeeze out excess air and seal the bag. Finely crush crackers with a rolling pin or heavy skillet. Pour 1/3 the crumbs mixture into a large bowl. Pour flour into a bowl. Pour eggs into another bowl. Gently press chicken pieces into flour to coat and shake off excess flour. Dip into beaten egg and press into cracker crumbs. Place the breaded chicken pieces onto a plate while breading the rest. Working in batches, cook breaded chicken in hot oil, turning once, until golden brown, no longer pink in the center, and the juices run clear, about 5 to 7 minutes. An instant-read thermometer inserted into the center should read at least 165 degrees F (74 degrees C). For best results, reheat the earliest cooked pieces in the oil for a few seconds just before serving. This avoids serving cold chicken. Oil that is too hot will cook the crumbs too quickly, making them nearly black before the chicken is cooked thoroughly. Cut a larger piece of chicken in half to verify it is fully cooked. HOLY garlic salt... I only added 1/2 tablespoon of garlic salt it was so salty that even I didn’t want to eat it and I love salt. My kids loved this meal and so did I. It was delicious and crispy. The crackers stayed on and the chicken was juicy inside. I did not use the ranch sauce and it turned out just fine. All of my kids loved it....even the picky ones! I used Ritz crackers and made no changes. This is such a good recipe. Nothing was left over. Oh so delicous. Of corse its not the healthiest recipe out there, but its so good. I made it with thin sliced chicken breast and my entire family loved it including my two picky brothers.